One month to go before the annual megalithfest at Glastonbury. It’s my first Megalithomania appearance since 2012. I have also been asked to act as some kind of tour guide on the Stonehenge special access visit on the Monday (14th May), my first since the old road was removed, the new Visitor’s Centre was completed, and I finally found an older, bigger analogue of the Stonehenge site in the Preseli Hills of West Wales. Surely not!? 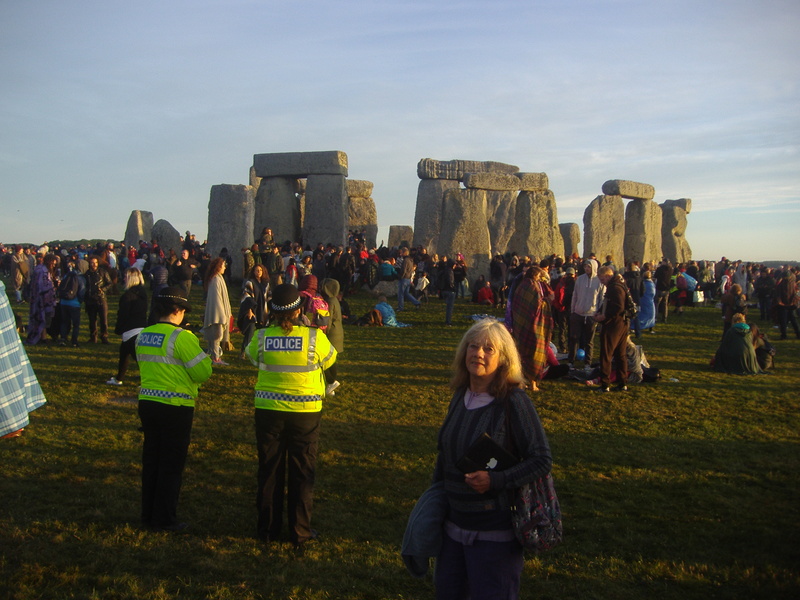 I’m giving two presentations: the first is Aboriginal Stonehenge in Wales (May 12th) which will be an update on my recent work and will include the recent boisterous new research into the relationship between Woodhenge and Stonehenge, which many readers of this website will already be somewhat familiar with. Stonehenge as a later imitation. In the 1970s, a motley assortment of leyhunters, dowsers and members of RILKO and IGR combed the Preseli hills of West Wales looking for evidence of a Preseli Zodiac. Support for their researches originated from ancient Welsh legends, and they almost found the original Stonehenge. For the past 33 years, Robin Heath has been living and working within this landscape, discovering that the landscape itself, together with the siting of several important megalithic monuments reveals the ‘zodiac’ that also formed the original design for Stonehenge. Robin’s illustrated presentation is the subject of a recently published book, Temple in the Hills. I have been honoured by being asked if I would give the annual John Michell Memorial Lecture (May 13th), entitled Keeping on the Old Straight Track. John was a very dear friend of me and my wife and we often walked miles of landscapes with John in search of evidence for prehistoric and ancient cultural evidence that supported the megalithic science of our ancestors. My own work was greatly accelerated by John’s energy and generousity. Applying John Michell’s legacy to new research. John’s books and lectures reintroduced two generations to a global prehistoric science whose traces were still visible because they had survived into later Babylonian, Egyptian, Minoan, Greek and Roman times. Although the scientific establishment remains to be convinced of it, this ‘megalithic science’ (which John sometimes referred to as ‘spiritual engineering’) remains recogniseable to modern thought. In order to demonstrate the effectiveness of the ancient sciences when correctly understood and then applied, Robin will revisit some of John’s favourite haunts, and pull a few new rabbits out of the hat. Many website readers have asked when Part Three of the tryptych article will finally appear, and the answer is between this event and midsummer, during the launch of the new composite Wooden Book ‘Megalith‘. This new tome includes my own contribution to this marque, a rewritten edition of Stonehenge with much new material plus some of Sun, Moon & Earth, within a contents page to satisfy the desires of anyone interested in prehistoric culture and ‘Old Stones’. At the time of writing this, the retail price for this bundle of joy is not available, but the other Wooden Book compilations have been set at around £14.99. Surely a whole lot of bangs for your buck at this price, with each separate WB’s priced at £6.99 this mammoth megalithic book is a hard bound bargain in a sparkly cover. Go on (the WB website), because you’re worth it!! The new year has brought me an opportunity to revise and update the first edition (2000 AD) of Stonehenge, one of those little sparkly Wooden Books, a genre founded by John Martineau. In Part One a single action began a process of investigation – I made a measurement of two physical realities. 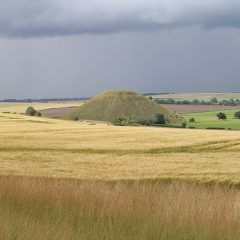 The first was the length of a line connecting Stonehenge centre to Woodhenge, centre, and the second was the angle of orientation that this line makes with respect to an east-west line, termed a co-azimuth angle. 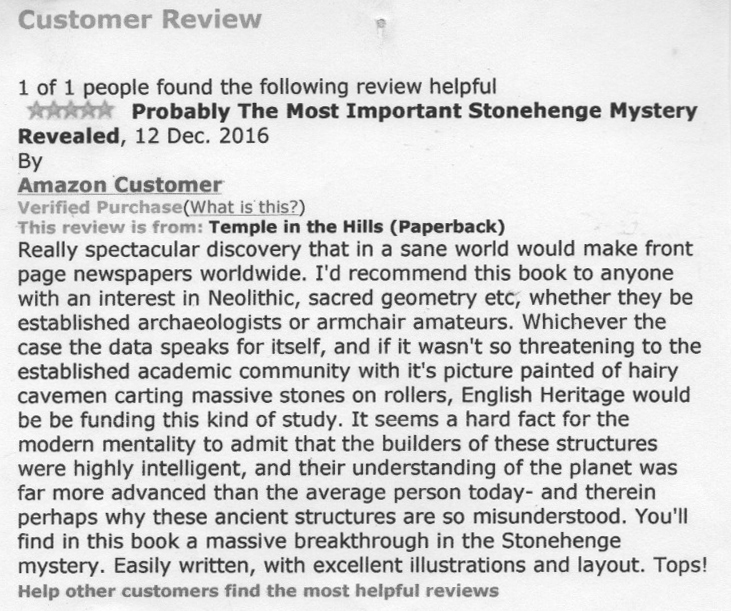 This second part of the article shows where that single action can lead a researcher into understanding presently unsuspected purposes within the designs of, in this case, Stonehenge and Woodhenge. Soon after the distinguished Welsh archaeologist Maude Cunningham and her husband finished work excavating the site we now know as Woodhenge, in 1929, the locations of each of the site’s many revealed postholes were marked with grey concrete bollards. The best that can be said of this action was that it ensured their original exact positions were recorded for posterity (see Alexander Thom’s photograph below, from 1958, courtesy of Eoghann MacColl). Visually, Woodhenge is neither a pretty nor an impressive site, unlike its nearest neighbour, Stonehenge, some 1.9 miles to the southwest. VIsitors to Woodhenge tend not to linger around this site, and soon slope off to nearby Durrington Walls, to the north, or Stonehenge, to the southwest. This article claims to lift the present Cinderella status afforded to this Neolithic class II henge and timber circle monument, by identifying a previously unrecognised significance in its geodetic placement with respect to Stonehenge. 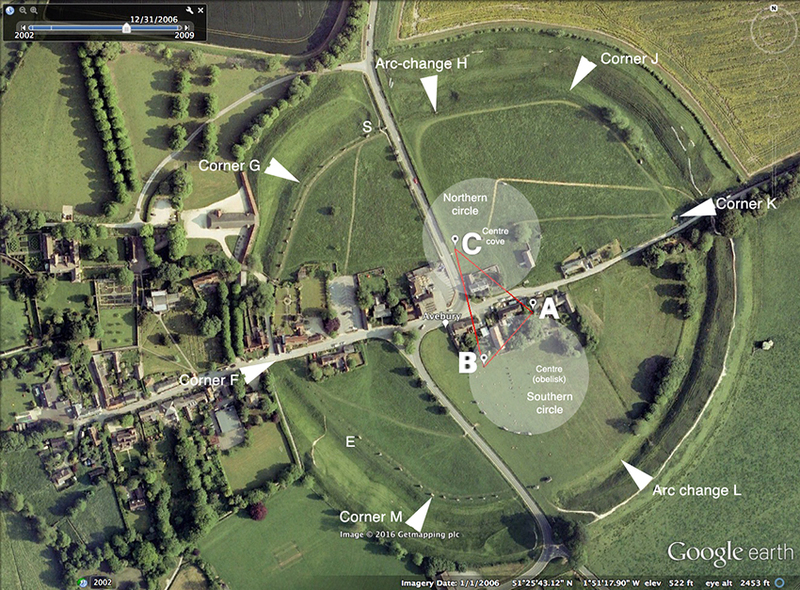 Interesting Factoids about Avebury + free PDF download. 3. A very detailed and accurate seven station closed traverse survey was undertaken by Professor Alexander Thom in 1978. 4. Thom reported that the perimeter of the outer stone ring was 1302.5 Megalithic yards (MY) of 2.722 feet, which is 3545.4 feet or 520 Megalithic rods ( 1 MR = 2.5 MY). 5. The geometry of the ring is based on a circle 200MY in radius (544 feet/ 1.66m) with centre at point D, exactly 60 MY from C (see diagram above). From A, B and C, each radius 260 MY, define arc FG, from A, arc HG, from B, and arc ML, from C.
In addition, there were two longer arcs struck from outside of the ring, of length 750 MY, from points W and Z (not shown on diagram). The remaining part of the perimeter is based on the forming circle perimeter, whose diameter is 200 MY..
7. The two inner circles are each 125 MY in radius and are therefore as big as any other true circle known in Britain, and the same size as the massive Ring of Brogar in the Orkneys. or missing in 1930. Only nine still stood. Despite this, Alexander Keiller and other archaeologists were able to locate the majority of the remaining stone holes in the chalk and restore much of the original monument, The geometry of the original ring has since been discovered by AlexanderThom. 10. When built, the outer stone ring contained either 98 or 99 stones, some weighing over 50 tons. AVEBURY TOUR (compressed) 2017 PDF file of full report. Below is a review of Temple in the Hills, given a five star rating by the reviewer. It’s better than any Easter egg. Half the print run has gone after five months and the book section lets you know how you may acquire a copy. An early chapter from this book is blogged earlier on this site. I am currently working on a second site in southern Britain, and it appears that the ground rules given in Temple in the Hills concerning the relationship between Stonehenge and the (earlier) ritual landscape of the Preseli Hills (bluestones, remember?) are applicable elsewhere within the major megalithic sites of Britain and Brittany. The Russia stones are three large (8ft) bluestone uprights, stonking great stones that were once part of a stone row marking to the Equinoctial (west – 270*)) sunset, part of a section of the Dinas Cross to Pontfaen road in the Preselis, near Russia (’tis true! ), where the road markedly changes direction and traces the path of the alignment for about 470ft (170m). Two of remaining three upright stones are those stand in front of the sun’s disc in the distance. All other stones, some massive, now lie recumbent, buried in the bank, just as one can find at the minor standstill moonset ‘detector’ (301.4*) at Parc y Meirw (Field of the Dead) stone row on the Llanychaer road, about a mile away. Prehistoric precision astronomy at its best in Preseli, with photographs of the event…read on! Thunderbirds are go! 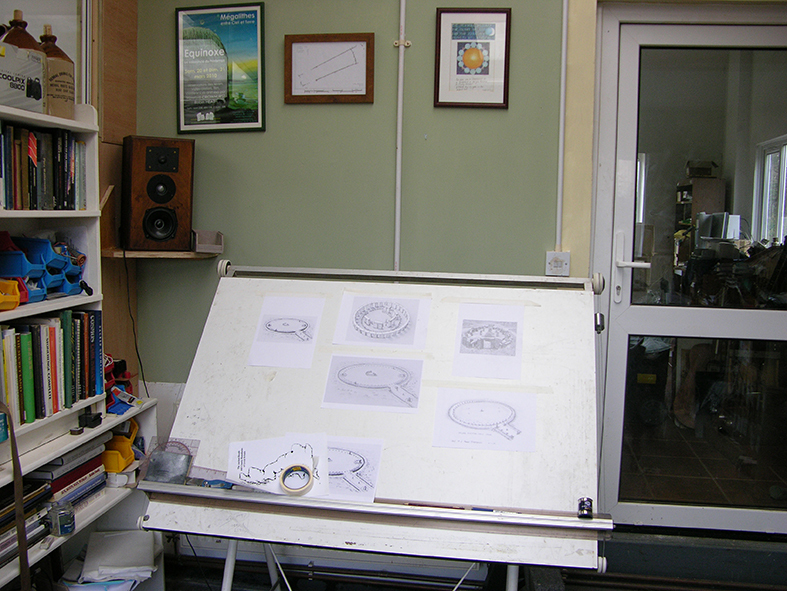 I have recently been invited to give a presentation on my work in the Preseli Hills at the first of the above events. This first event is being held at the Memorial Hall in Newport, Pembs, which is located on the right as one leaves the village travelling on the A487 towards Fishguard. Please note that parking can be the devil’s own business there, so the Carpark down the hill may be a wise decision, travelling towards Fishguard, and before you get to the Memorial Hall, it’s on the left at the main crossroads in the town, and just a short walk gets you to the hall. 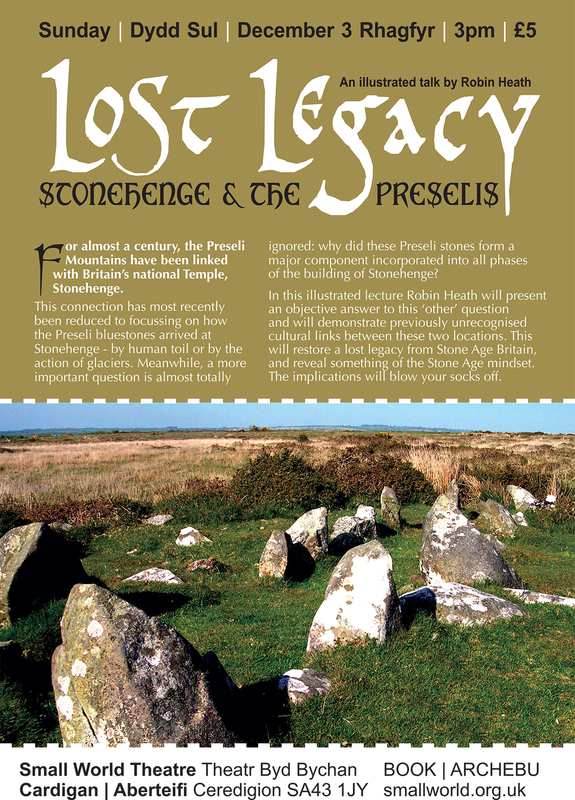 I am informed that fizzy drinks and canapes are going to be available, and I’m told by Paul Sanday, a geologist and the organiser of the event, also one of the speakers, that he wants to “get things moving on the debate about Stonehenge’s connections with the bluestone sites within the Preselis”. I wonder how much stirring of these dark and well muddied waters might he be looking for!? Usual photos, storyline and new research from me, plus question time and jolly books for sale with some humour. Could be a lot of fun. The second event is hosted by the long standing, successfully managed and well informed West Wales Dowsers, associated with the BSD. The venue is Bronydd Village Hall, about two or three miles from Carmarthen on the main Newcastle Emlyn road to Cardigan. The post code is SA33 6BE for all you non-dowsers. And for those who eschew the sat-nav, one turns at the sign for the steam railway, following the road past the station, then, after about a quarter mile the village hall is on the left. The clue is that it looks just like a village hall, and is sited opposite Timberman and before the charming bridge over the river. Huge free carpark. Doors open at 1:45 for a 2pm start. 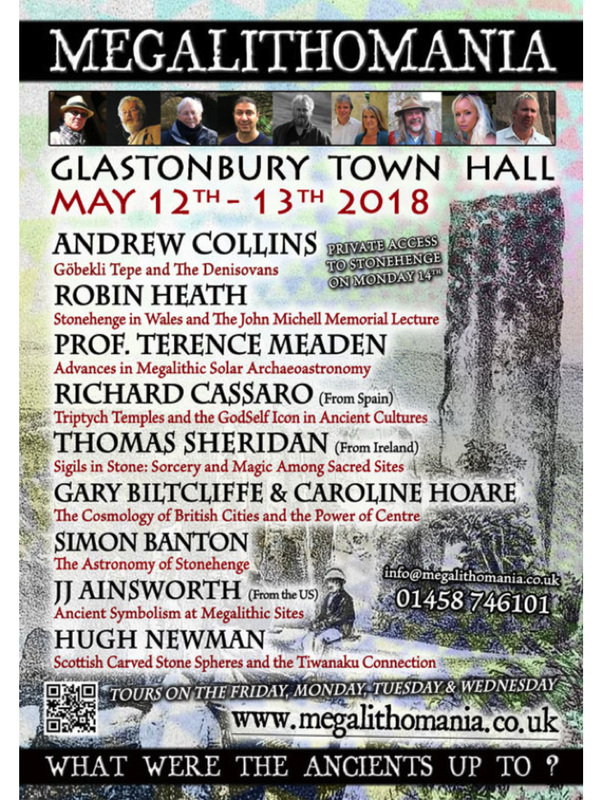 I’ll be presenting lots of stuff about my research, and my latest book, Temple in the Hills, plus a Q&A session, and you’ll also get the chance to mingle and chat with loads of nice folks into all manner of interesting aspects of the earth mystery genre. The secretary is Jennifer Forrest. Certainly better than watching an old black and white ‘B’ movie on the telly! All done by 4:30pm, in time for everyone to get home for Countryfile.